Splinter Cell Conviction Serving Sentence on PS3? Splinter Cell Conviction will see its long awaited release on the 360 in April and even though PS3 owners would love to get their hands on the game, Ubisoft has made it clear that the game is only releasing for the Xbox 360 and PC. 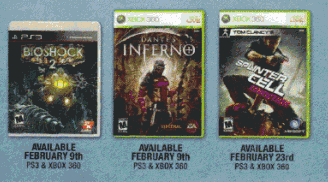 However a recent listing by Blockbuster is singing a different tune showing the game listed for both the PS3 and 360. The listing does have an old release date of 2/23/2010, which has of course already passed us by. This is most likely an error on Blockbuster’s part but who knows, Blockbuster might actually have some sort of information pointing towards a PS3 release. Until we receive word from Ubisoft concerning the situation we will just have to call this a rumor, and even more likely, a listing error.